Alan Schmitt is Executive Director of the Frisco Museum, Springfield, MO. The Frisco was family! Ask anyone who worked for them or lived in a Frisco town and they will all tell you the same thing-the Frisco was a Family! The Frisco, officially known as the St. Louis-San Francisco Railway Co., was incorporated on September 6, 1876, and throughout its 104 year history (it merged with the Burlington Northern Railroad in 1980) the line played a dominant role in the economic growth and development of Springfield and Southwest Missouri. It provided local business and industry with a transportation life-line to the major commerce centers of St. Louis and Kansas City. As Mayor Carl Stillwell observed during the May, 1970, centennial celebration of the Frisco in Springfield, "The Frisco has contributed much to the growth of Springfield, and has also provided the means whereby the products of our great city are distributed throughout the nation, aiding in the development of our industries, and careers for persons employed by them." A song, written for the occasion, called The Frisco Made It Happen, ended with the words, "They made it click, the Frisco and Springfield did the trick." While economic growth and development was certainly the primary goal of the railroad, and to many the most apparent evidence of its impact on the region, the process by which that growth and development was realized can best be understood when viewed from the perspective of the Frisco Family. When one looks at a railroad map of Southwest Missouri, it quickly becomes apparent that Springfield was the hub of railroad operations, the spokes of which were created by a family of pioneer railroad ventures. The first arrival was the South Pacific Railroad Co., incorporated May 12, 1868, by Andrew Pierce, Jr., Francis B. Hayes, and Clinton B. Fisk, to take over and complete the property of the Southwest Pacific Railroad. The property of the latter had been seized for non-payment on bond indebtedness on June 21, 1867. When the new company took control of the line on July 1, 1868, it extended from Franklin (now Pacific, Missouri) to Rolla, about eighty-nine miles. One year later, the line was completed to Lebanon, and on May 3, 1870, the first passenger train pulled into a new town, created by the railroad, called North Springfield. On October 26, 1870, the line passed under the control of the Atlantic and Pacific Railway Co., who extended it through Seneca, Missouri, to Vinita, Oklahoma (Indian Territory). While the arrival of the railroad was applauded by many, its route through a new town over a mile north of Old Town Springfield created an intense rivalry between the two communities. That, in turn, fostered a competitive spirit on the part of Old Town that ultimately caused the birth of another member of the Frisco Family lines. Not to be denied a railroad to their town, a group of Springfield entrepreneurs formed the Kansas City and Springfield Railroad. Although there is no record of the company ever being incorporated, it is known that by 1872, it had completed some grading for a railroad between Springfield and Ash Grove to the northwest. Seeing the apparent possibility for a competitive railroad link with Kansas City, the unfinished roadbed was acquired by the Springfield and Western Missouri Railroad Co., incorporated September 9, 1875, and the line was completed to Ash Grove three years later. In March, 1878, the Thomas A. Scott locomotive steamed out of North Springfield with a S.&W;.M. mail car full of dignitaries and ran over the line, according to the Springfield Weekly Patriot-Advertiser, March 7 edition, "...at a speed so tremendous that the telephone posts all appeared to run together and make one pole." This early pursuit of a Springfield-Kansas City line paid off four years later when the Ft. Scott, Southeastern and Memphis Railroad Co. completed a connection with the Missouri River, Ft. Scott and Gulf Railroad at Ft. Scott, Kansas, via the Springfield and Western Missouri line through Ash Grove, into Springfield in December 1882. Six years later, the forces of the Kansas City, Springfield and Memphis Railroad Co., incorporated March 31, 1883, extended the line in a southeasterly direction to the river port of Memphis, Tennessee, thus adding yet another spoke to Springfield's railroad hub. The last two members of what would ultimately become the Frisco Family in Springfield were born in 1882 and 1884. On June 10, 1882, the Springfield & Southern Railway Co. was incorporated by the Frisco to build a line south into the rich timber region of Northwest Arkansas. By 1885, when the Frisco took official control of the company, it extended thirty-four miles south to Chadwick and was known by local residents as the Chadwick Branch. On May 3, 1884, the Springfield & Northern Railroad Co. was incorporated to build a line north to a connection at Bolivar with the Kansas City, Osceola and Southern Railway, thus giving the Frisco a competitive line to Kansas City. It should be noted that in 1887, the enmity between Springfield and North Springfield, originally created by the railroads, had diminished to the point that the two towns consolidated into one community. 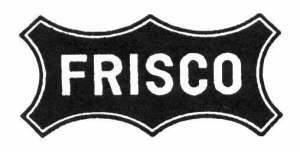 By the turn of the century, what started out as a series of competitive railroad ventures were also consolidated into one Frisco Lines family with a unified Springfield as its hub of operations. One additional aspect of the Frisco Family influence on the Ozarks bears mention. In the process of building tracks and running trains, there emerged hundreds of small towns, the genesis of which were water tanks, stock pens, and feed mills located approximately every seven to ten miles along the line. Today, one can travel along any railroad line emanating out from Springfield and see examples of the Frisco Family. To the northeast: Stratford, Northview, Marsh field, Niangua, Conway, Phillipsburg, and Lebanon. To the North: Ritter, Willard, Pearl, Walnut Grove, Wishart, Morrisville, and Bolivar. To the northwest: Elwood, Bols D'Arc, Ash Grove, Everton, South Greenfield, Lockwood, Golden City, and Lamar. To the Southwest: Nichols, Brookline, Republic, Billings, Marionville, Aurora, Verona, and Monett. To the southeast: Turner, Rogersville, Fordland, Diggins, Seymour, Cedar Gap, Mansfield, Norwood, and Mountain Grove. They were all Frisco towns! The Frisco was a family, and those of us that have made Southwest Missouri our home are a living testimony to the role it played in the early growth and development of the Ozarks. The following article is based on an extensive interview with Alan Schmitt, Frisco Museum Executive Director, on March 10, 1993. The interview was conducted by Lise Truex for the Center for Ozarks Studies. During the ensuing summer the museum was moved to its present, permanent, site in Springfield. LT: How did you become interested in Frisco history? AS:The seed was planted back when I was growing up on the north side of Springfield. We lived within sight and sound of the Frisco shops. In the course of researching the arrival of the Frisco in Springfield, I ran across a little book called Frisco Folks, 1969. William Bain, the author, went to the Frisco Hospital in St. Louis, at the time the equivalent of a railroad nursing home, sat down with the old timers, and asked what life had been like on the Frisco. Those reminiscences were the heart of Frisco Folks. That got me thinking about my family and the Frisco. My grandfather, two of his brothers, my father-in-law, his father and his brother, my mother-in-law's father, her brother -- all worked for the Frisco. I realized I was part of that extended Frisco family. I began frequenting local flea markets and antique shops, seeking Frisco memorabilia. LT: What sorts of memorabilia did you find? AS :First, a box of matches -- a "boxcar box" of book matches. My father-in-law said, "Oh yes, I gave those things away." Then other pieces. I researched each one -- what it was used for, when it was used, etc. I started displaying them on one wall in the basement, then another, then another. I finally closed half the basement into "the train room." A friend said, "Alan, you've got a regular museum hem." He's now a Frisco museum member. In 1980, when the Frisco-Burlington Northern merger took place, the Burlington Northern waged a campaign to remove all visible evidence of the Frisco. I don't fault them. In corporate take-overs, the principal corporation tries to get rid of evidence of the other company. They believe that helps to assimilate the two companies. However, it bothered me -- and a lot of other people too. The Frisco was not only an important part of my personal history, but was an important part of the history of Southwest Missouri. Somebody needed to do something. I kept saying that over and over again. My wife finally said "Well, why don't you do something about it, or shut up." I didn't know anything about a museum. So I talked to people who did. I visited railroad museums, talked to people that were involved in them, talked to railroad historical societies, etc. I wanted their advice. LT: What advice did they give you? AS:They all said, people will not donate to an idea, regardless of how good it might be. People want to be involved in what they can see. One said, "If you are really serious, you've got to have enough nerve to start something on your own, with what you've got." So I said, "Well, let's give it a try. What can it hurt? It's going to cost a little money; but let's go at it with the idea that we're planning a long-term, professional, preservation organization." We developed an organization, acquired not-for-profit and tax exempt status, and remodeled the garage into a railroad depot. On June 1, 1986, we opened the doors. I had been collecting for sixteen years--almost a thousand pieces of memorabilia. About 150 people came to the grand opening, and it continued from there. It seems as though everybody that's lived in this part of the country for any length of time had some kin that worked for the railroad. We published a little newsletter. The memorabilia collection grew. The archival collection grew. People started contributing personal things. Let me tell you a favorite story about a Frisco brakeman's cap. One of my friends said he had been at a flea market, and they had a Frisco passenger brakemen's cap -- a rare item. My first inclination was to go there as fast as I could and get it. Then I thought, "No. Something that rare, it will be too expensive, I'll want it, I can't afford it, and I'll be miserable. So be brave, be strong, don't go!" I moped all week. I couldn't get it off my mind. Finally I told my wife I was going to see the cap. At least I can say that I've seen one. I was there when they opened the door the next morning and asked, "Where is the Frisco brakemen's cap?" They said, "I'm sorry, we sold it." I was devastated. They sold it quickly because it really wasn't very expensive, and I could have afforded it. I came home absolutely miserable. Then my daughter came in with a paper sack and said, "Here Daddy." It was the cap. She was going to save it for my birthday or Christmas; but they were all so tired of me moping around they decided to give it to me early! An elderly lady came in one afternoon; she told me she was 82 years old. Short, gray hair, and feisty. On the collar of her sweater was some kind of a pin-back, but her collar was turned so I couldn't see it clearly. Pretty soon she said, "You ever seen one of these?" She said, "I got that when I first worked for the Frisco in 1927. You don't have one of these do you?" (It was a Frisco safety pin.) I said, "No ma'am, I sure don't." She pulled it off and put it down and said, "Now you do !" By 1990, I was working two full time jobs --teaching school and working on the museum project. I'd get home about 4 PM, and then go out to the museum office and work until ten or eleven. I'd work all day Saturday, and Sunday afternoons. It finally got to the point where I had to say, "Where are we in terms of our goals, and where are we going?" After negotiations and discussions with my family and the Board of Directors, I concluded I would never know if the museum could really succeed unless I devoted my full time to it. I quit teaching and we became a one-in-come family -- my wife's income. 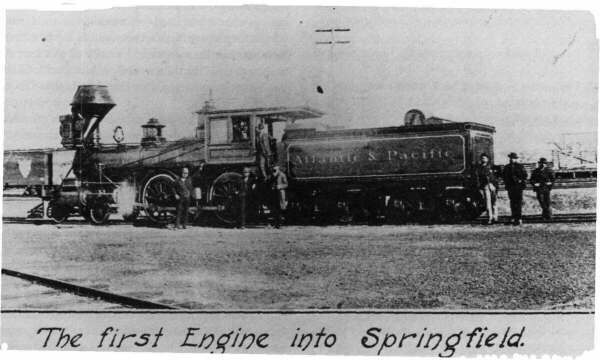 First locomotive into Springfield, Missouri on the new Atlantic and Pacific road (later St. Louis and San Francisco), 1871. 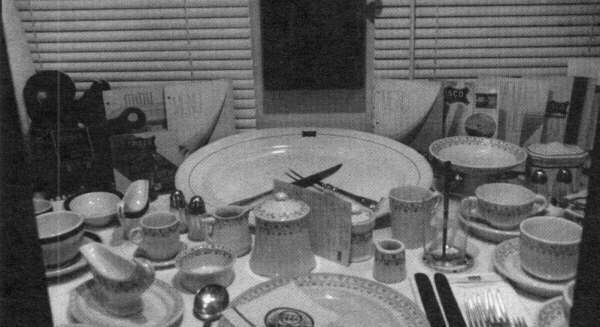 Display of Frisco table service used in dining cars. Frisco Museum. About three years after the museum was in operation, I received a letter from William Bain -- the author of Frisco Folks. I thought, "Oh Jesus, this is the guy that was the source of inspiration for all of this." When I composed myself, I called him and I told my story. He had been diagnosed with cancer and had only about six months left. He wanted to give the copyright of the book to the museum. We will reprint it when the time is right. He also gave us some 400 valuable Frisco photographs. "You've got to come and get them," he said; "I don't trust sending them through the mail." So one weekend my daughter and I decided that we would make a fast trip to Kentucky. Unknown to us, that afternoon Mr. Bain had a heart attack. We got the pictures and got a copy of the book; but I never met him. I found out later that he had died. LT: How did you choose the property on Commercial Street for the museum? AS:I had five site criteria. The site should be near or adjacent to former Frisco trackage. It should be in an area of Frisco historical significance. It should be large enough to allow for expansion. It should have an existing structure, preferably Frisco built, that could be modified or renovated for museum purposes. Finally, acquisition and development costs should fit our limited resources. We examined nine different sites: in Ash Grove, Willard, Republic, and six locations in Springfield. The only one that met all five criteria was in Springfield, on the corner of Commercial and Washington streets. It was a former Frisco traffic control building, constructed in 1944, now owned by Burlington Northern. After some months of negotiation, they leased it to the museum for an indefinite term, at one dollar a year. LT: Are you expanding your museum membership? AS:Yes. At last count we had 428 members in forty states and three foreign countries. Last year we had a net gain of sixty-six new members. Our five-year goal was to have a net membership of fifteen new members a year. Based on those goals our membership is soaring. So far this year I've had 52 new inquiries. LT: What goes into your magazine? AS:All Aboard is designed to offer articles based on the interests of members. They divide into three categories: 1) active or retired railroad employees, 2) model railroaders, and 3) "rail fans" -- people who for a variety of reasons like trains, railroading, and the Frisco. So in every issue there are articles that appeal to those groups. For instance, there's always at least one article for model railroaders -- how to build a model of a particular Frisco car, for example. Or how to take a model engine that's commercially produced and change it, modify it, paint it and number it so that it will be Frisco. One of our members, a master model railroader, writes an article for each issue called "Rick's Tips" listing little tricks about modeling. Then there are historical articles. I profile a depot in each issue, rotating them around the nine states where Frisco operated. The depot article includes a history of the line into that town; a photograph of the depot; the blueprint of the depot; a list of other depot facilities, like water tanks, stock pens, cotton compresses, ice houses, etc. ; a history of passenger service--when it started, what trains went through there, when it ended, etc. The depot article appeals to various interests. Right now AllAboard is published bi-monthly. It's now twenty pages; but I need twenty-four. Rail fans like pictures, so we try to have at least 20-25 pictures in every issue. 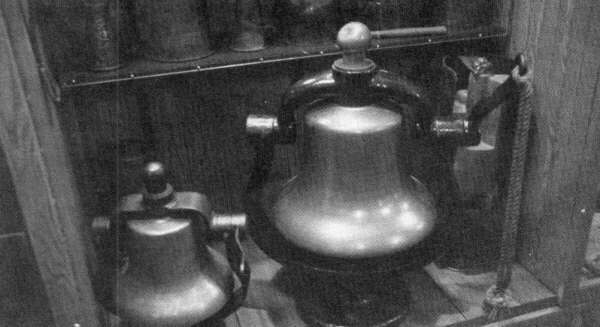 Brass bell display, Frisco Museum. LT: How has the museum organization gone about acquiring a caboose? LT: You have two cabooses? How did you manage that? AS:The first one sits behind one of our buildings in Ash Grove. When I was teaching, one of my students came in one day and said, "Mr. Schmitt, have you ever seen that caboose over there by Bois d'Arc?" I said, "No, but I will before I go to bed tonight." He gave me directions and I went over. There was an old wooden caboose sitting in a field. Apparently somebody had once intended to turn it into a hunting cabin. It was just sitting there rotting away. I tracked down the owner and asked him what he was going to do with the caboose. He said he wasn't going to do anything with it right then. I said, "If you decide you want to sell it, I'd appreciate you giving me a call." Well, a couple years later, he called me and asked me if I still wanted the caboose, and asked me to make an offer. I made three offers, from him donating it up to paying him $2,000. Needless to say, he wanted the $2,000. So I then went to the membership and told them we had the chance to buy a Frisco shop-built caboose. We set up what we called "Project 139," which is the number of the caboose. We set out to raise $2,000 in a year, and we raised it in eight months. I talked the National Guard Engineering Unit into moving it for us as a weekend activity. The second one the Springfield Family Y donated to us. It's sitting out there at Y Camp near Halltown. The camp director was thinking about renovating it and using it for a classroom or something. As he was describing it to me, I realized it is one of only two cabooses like that which were built out at the Springfield shops in the '50s. Subsequently they decided to donate the caboose to us. What the railroad company had done was take a boxcar and rebuilt it as a caboose to use in what was known as "mixed train service." Mixed train service meant that passengers could ride in the caboose of a freight train because there wasn't enough revenue for another passenger train. One end of it is the caboose, and the other end of it is a baggage room. We are going to build it into our new building -- it will be inside. LT: Have you considered trying to buy an engine? What about rolling stock? Have you tried to acquire any? AS:We already own the two cabooses, one on site at the museum. We've looked into the possibility of acquiring engines. Not necessarily to run them, but as a standing display. It's an advantage of the Springfield site-- we have room to bring equipment in. LT: How many visitors do you expect? AS:In our first full year of operation we expect 22,000. That's based on one half of one percent of the number of people that drive down Highway 65 going South during the course of the year. We're hoping to draw a lot of that tourist traffic in. We're going for tour buses too. The Railroad Historical Museum in Grant Beach Park, Springfield, displays "Frisco No. 4524," a large steam-powered locomotive, together with a Burlington Northern caboose and express car with railroad memorabilia. The all-volunteer organization includes engineers who actually operated old 4524.